Former Italian militant Cesare Battisti has been released from prison in Brazil, after the Supreme rejected Italy's extradition bid. Italy had appealed against a decision by Brazilian ex-President Luiz Inacio Lula da Silva to deny extradition. But the Supreme Court ruled that his decision did comply with a bilateral treaty. Battisti, 56, had been convicted of four murders, charges he has always denied. The nine Supreme Court judges voted 6-3 to refuse Italy's attempt to appeal, and ordered that Battisti should be freed. "At stake here is national sovereignty. It is as simple as that," said Judge Luiz Fux, one of the nine. 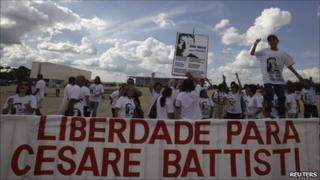 Battisti was released from the Papuda maximum-security prison within hours of the ruling being delivered. Expressing "great regret" at the decision, Italian Prime Minister Silvio Berlusconi said it "denies justice to the Italian people and in particular to Battisti's victims". Battisti says he is the victim of political persecution in Italy. He has been on the run since escaping from an Italian jail in 1981 while awaiting trial, and was convicted of murder in absentia in 1990. He spent many years in France - where he started a career as a novelist - before moving to Mexico and finally Brazil, where he was arrested in 2007. Last year, the Brazilian government accepted Battisti's request for political asylum, but the Supreme Court ruled the designation was illegal as he was convicted of "common crimes" rather than political acts. Former President Lula's decision to refuse the Italian extradition request, a day before he left office in January, caused fury in Italy, which withdrew its ambassador.